My sister passed away over 2 years ago, not a day goes by that I do not think of her. 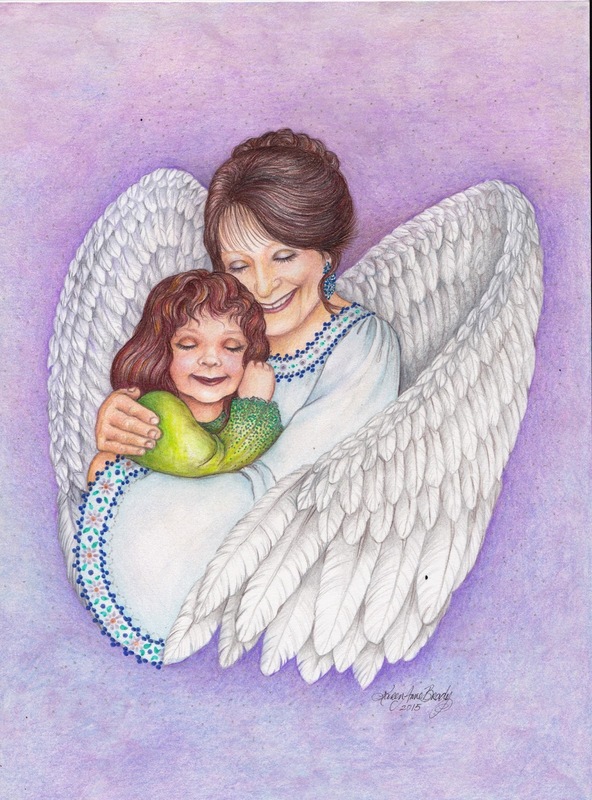 Earlier this year her eldest daughter and her little girl came by to visit and brought a favorite photo of my sister hugging her granddaughter ... when I saw the photo it reminded of an angel hugging onto a little loved one. Or perhaps it was the saying my niece had written under the photo "Annika's Angel" that made me see my sweet sister as an angel hugging her granddaughter. I hope you enjoy looking at "Annika's Angel". The first part of this year has been what I would deem as NOT routine. We lost our little min-pin due to liver cancer; hopefully we will have a little min-pin puppy to fill the void left by Danny Boy in late summer or early fall. One of the few pieces of artwork I have completed this year included the one below with Danny Boy as part of the subject matter. Actually completed shortly before he crossed over "The Rainbow Bridge". It doesn't quite look like him, but enough so that I know it is him. "Storytime" (February CPM Art Challenge) reference photo by Sally Robertson. My hubby has been having a really rough time, health wise, and has spent a considerable amount of time in and out of the hospital. We have been married for over 47 years, and I have found this to be very hard to experience. At times I wish I had a magic wand that I could wave over him and make him healthy and happy. Instead, I pray ... a lot. Guess you could say I am using a magic wand of sorts, it just happens to be called prayer. Currently I am working on the May Challenge (deadline is 6/10/15), the photo reference is a "White Peacock", already there are several magnificent entries! Oh! I did have fun recreating the clown I did in acrylics in December 2014, this time I did it with colored pencils for an entry in a "Nibblefest Art Challenge", this was a fun piece and ended up with a lady who really likes my artwork. Earlier this year I thought it would be fun to try out a few pieces using white colored pencil on black paper ... the results were actually better than I anticipated! This pretty much catches you up on my art activity for 2015, not much but at least it is something! Nibblefest Art Contest for January 2015! The Nibblefest Art Contest begins in one week! (on the 20th) January's theme is "A Subject Beginning With the 3rd Letter of Your Given Name (real first name)". Nibblefest Art Contest (NFAC), is the fun and friendly, monthly-themed art competition that begins on the 20th of each month, and is open to all. Hosted via Ebay, all Nibblefest art entries start at just .99 cents -- fun for artists AND collectors....! 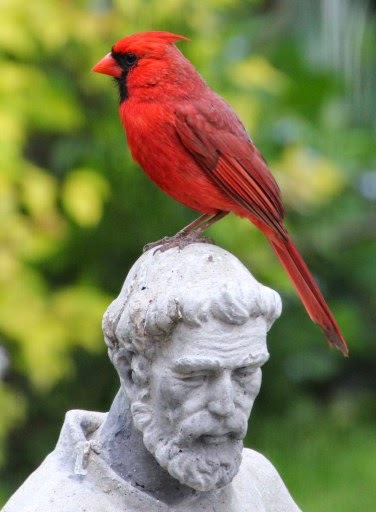 For this painting I used a reference photo by Gillian Floyd posted on the site, Paint My Photo, of a cardinal perched on the St. Francis statue in her backyard. I loved the photo and thought it would be perfect for my entry in this month's Nibblefest Contest! On the 20th of January you will be able to go to eBay and put the word NFAC in their search engine and you will be able to find it and many of the other terrific entries in this contest. Remember, all entries start at an opening bidding price of $.99! You could win a piece of terrific original artwork at a lower price than expected! 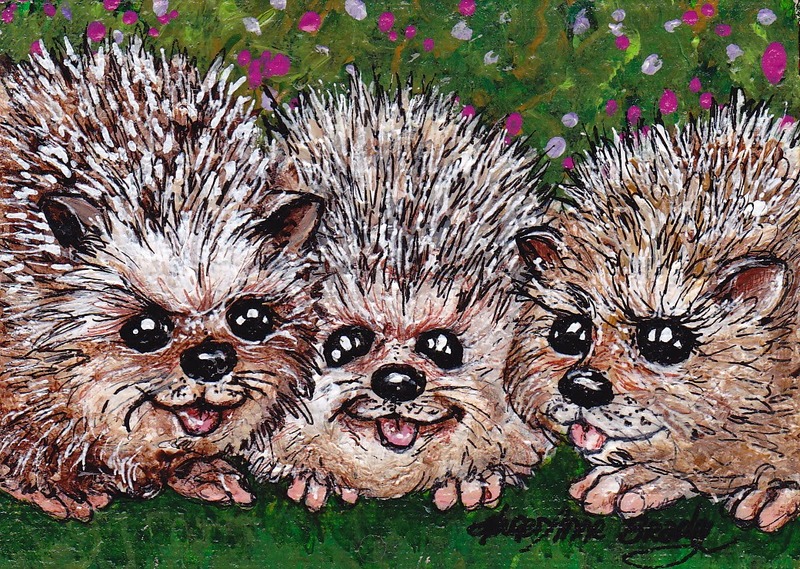 "Three Hedgehogs in a Row"
I liked this one a bit better and kinda got the "feel" for working with acrylics again. Lisa wanted a vintage type clown that wasn't so freaky that she could frame it and hang it in their home. I finally came across a vintage clown that I loved and thought would fit the bill! I looked all over the internet and found this photo posted on several sites; sent messages to people to see if I could learn if this was a copyrighted image ... but no one answered my queries. Eventually I deduced there probably was no copyright on this photo but not wanting to tread on anyone's claim of ownership decided I would paint the clown for personal use only and not sell any prints of this piece. I think that is in keeping with copyright laws, if not ... I am sure someone will enlighten me. My son wasn't too sure about the subject of this gift, but stated that he loved it and would get it framed and hang it in their home. We'll see! "Christmas Clown" turned out well enough that I am encouraged to try my hand at more acrylic paintings in 2015. Maybe experiment with different types of acrylics to learn which best suits my style. 2014 ended on an encouraging note and I am hoping that 2015 will bring along some over due blessings for my hubby. HAPPY NEW YEAR to one and all! Hi my friends! It has been awhile since I last posted anything so today I have 4 new lil' images to share with you since my last post. I am enjoying working on my "Lil' Friends" series and taking my time with each new little creation. I am trying to hone my colored pencil techniques by not rushing through any piece, which is hard to do because I am always exceedingly anxious to see the finished piece! One thing I truly appreciate about colored pencils is the fact that I can stop what I am doing at a moments notice and it will be there waiting for my return. A small blessing when you life becomes a bit more hectic than one would prefer. A necessary tool in the art of colored pencil painting is a good blender and after trying a multitude of blenders a friend of mine suggested I try a "Caran D'Ache Full Blender Bright" and now I am one of its biggest fans! It is really an amazing tool and seems to cut down on blending time by at least 50%! The only draw back I have so far found is that it doesn't provide a good foundation for applying ink because of the glossy surface it produces, but an application of a workable matte fixative helps to reduce that problem; one does have to wait for the fixative to fully dry before trying to apply ink to the piece. On "Lil' Miss Steampunk #1" I did not wait long enough ... I had finished the piece except for the background and so I colored it in, blended it with the Caran D'Ache Full Blender and began applying ink for the wall paper design. When I was nearly finished I noticed I had smeared nearly all of the inks (gel pens and art pens alike) ~ I was horrified! All that work and at the nth moment I had ruined the piece! OH NO! After studying the mess I had made (luckily none had smeared on the subject) I decided to smear the entire background together which created a purplish greenish gray effect. I then sprayed it with a matte workable fixative, waited for it to dry and then re-did the wall paper designs ... happily it worked out and the piece was salvaged! Actually, it looks better with the darker wall paper ... guess you could say "God" was helping me out by providing a learning experience. All four pieces are now available as Open Edition ACEO Authorized Art Prints in my Etsy Shop for a staggering $1 each! 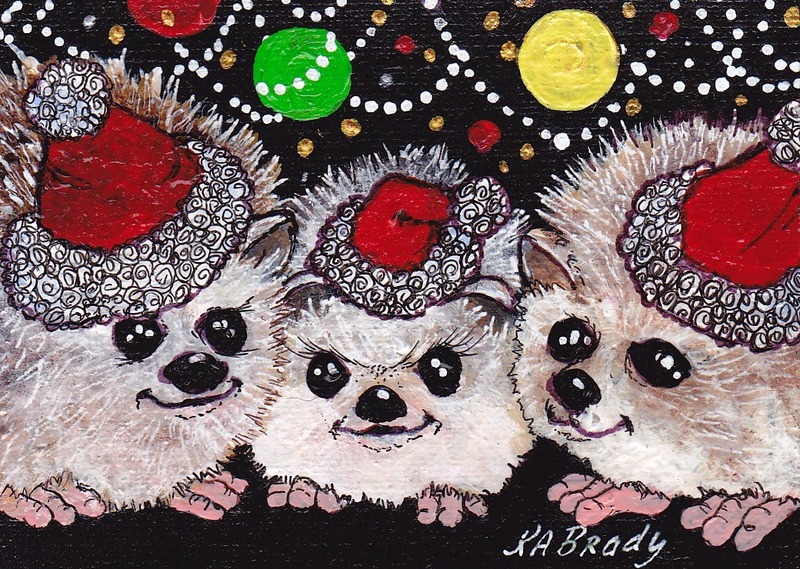 ACEOs make wonderful little stocking stuffers and fun additions to Holiday, Birthday, and gift cards! I have two more Lil' Friends sketches worked up (Lil' Witch #4 and Lil' Witch #5) that I hoped to get transferred to paper soon and colored in. Hopefully I will get them completed and posted before November 2014! LOL! The August 2014 CPM (Colored Pencil Magazine) "Fox Friend", with reference photo from Patricia Sue Overton, was an intriguing challenge so I decided to take it on. This time I forced myself to use a soft touch and tiny pencil strokes, which is so difficult for me! Tackling animal fur was another challenge all unto its own. This one is actually about 99% totally colored pencil, I tend to lean heavily on my art pens but in this one I purposely strove to use extremely sharp pencils for the fine details ... except for the whiskers and around the eyes. I found some drafting vellum that Jim had brought home about 20 or so years ago and decided to use that for this piece. I like working on vellum ... it is tough and stands up to my abuse (erasing and scraping off excess pencil)! I thought I was finished with the piece yesterday and brought it down to show Jim, he looked at it and said "this is really nice, but the rear looks like a fluffy ball, not like an animal's rear haunches.". Well, I wasn't too happy about that comment and kinda huffed around a bit. Then I looked at it again and "yep" it looked more like more like a scrubbing pad ... so I put it away. 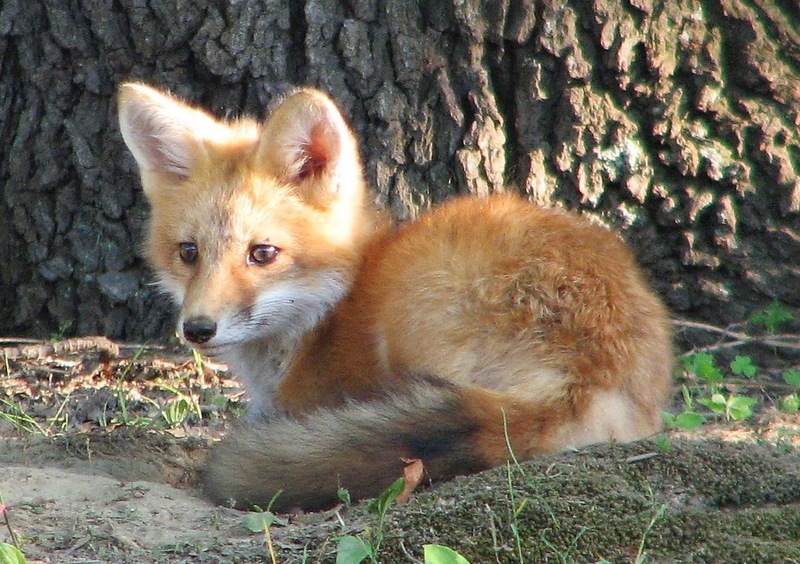 I had gotten so caught up in the pattern of twists, twirls and curves of the haunch fur that I had neglected to take highlights and color variations into consideration. As I was studying it this morning, I decided that area already had too many applications of colored pencil and determined I should try to remove excess pencil rather than add more. I took an X-acto knife in hand and slowly began gently scraping away excess pencil to reveal highlights in the fur. I finally got to the point where I figured if I worked on it any further it would quickly go from bad to worse. I will say one thing, I am getting a bit better at animal fur yet I sure have a long way to go! Hope you like my efforts. If you'd like to point out what I could have done better ... I promise I won't "huff" but take your kind critiques into serious consideration. Thanks a bunch! and followed today by "Lil' Forest Fairy"
"Lil' Circus Clown" is entered in the Grumbacher monthly ATC Art Swap with its circus theme; and Lil' Forest Fairy" is entered in the Nibblefest Art Contest (NFAC) monthly Art Challenge with its theme of forest creatures. I am hoping they both do well! Off to work on another "Lil' Friend"! Hello Friends! 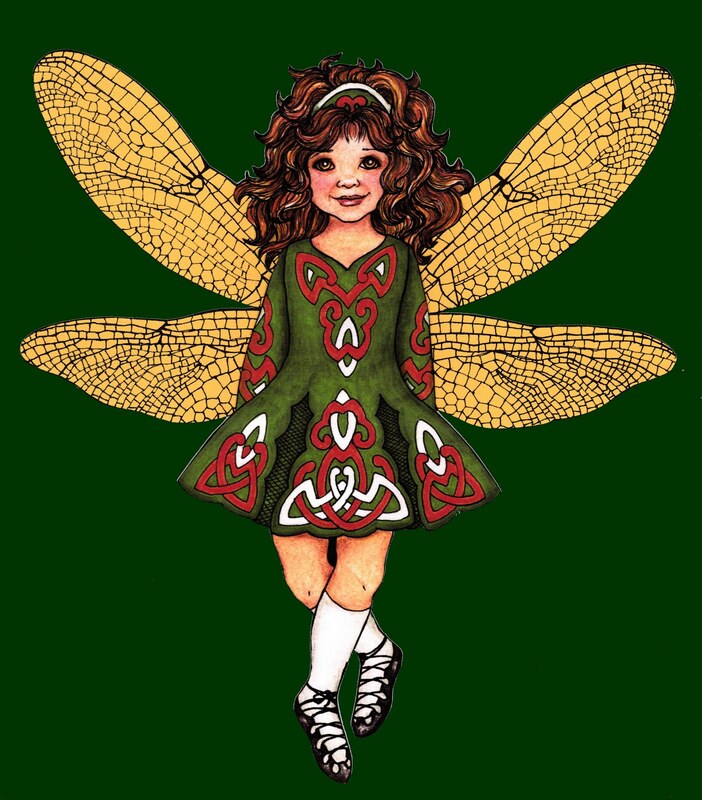 I recently completed a colored pencil entry into the Colored Pencil Magazine's July 2014 Art Contest because I loved the dragonfly reference photo. I didn't win the CPM contest, but I did win in the fact that I tried out a totally wet colored pencil background and a different technique for doing the wings, which I really like. However, when I look at the finished piece, it just seems to be lacking something so I made a print and added leaves to see if that is what is missing. Before I alter the original I thought I would present it to you to see which you prefer. Dragonfly with plain background? Dragonfly with leaves? Working on Lil' Dragon, Pyro Training has been a bit slow going ... seems like yard work and house work seem to be taking precedence lately! Pooh! Today was the only free day I have this week (meaning no appointments, no shopping) so this morning I got an early start before the heat set in and edged the entire back yard! In most cases, edging wouldn't be a big task .. however, in our case, the edges rarely get trimmed and soon they begin to drastically encroach on the grass area. As the grass (er, mowed area that is comprised mostly of weed type vegetation) becomes smaller and smaller I begin to envision a huge weed jungle of over 6' high beginning to take over! Ergo, today I donned my "Edging" gear, plugged in the weed eater and mulched weeds back to fences, garages, and house foundation! Tomorrow, all that downed vegetation should be pretty well dry and I can rake it up before my first appointment of the day! The little guy is coming to life! I am liking the color selections in this version but have already figured out some more changes that need to be made to this charming little character in my next rendering! Take care and happy day! HAPPY FOURTH OF JULY USA! Hope everyone is having great weather to celebrate this day of Independence! We are just hanging around the ol' homestead. I was able to spend a bit of time working on "Lil' Dragon, Pyro in Training". Yes! I was able to apply a base coat with watercolor paints to the body and the fire, and then I began work on the shadowing of the wood in the fire pit. I also lightened up the sky a bit, to add more contrast, with a light grey colored pencil. I am looking forward to working on the little guy some more tomorrow! And Jim tried, in vain, to locate which circuit breaker has deadened all the electrical outlets on the north side of our home; the circuit box labels do not make much sense at all and after 2 days of trying to figure things out, Jim finally broke down and called an electrician who should be here next Tuesday. 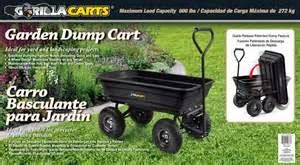 As an alternative project, Jim is now working on putting together our new Gorilla Garden Dump Cart! It should make yard work much easier than trying to drag stuff around in a recycling tub! Best wishes for wonderful 4th of July celebrations all across this great nation! This scanned image is actually a bit lighter than the original, probably because I just ran a quick automatic mode scan; but you can see where I am going with this piece. 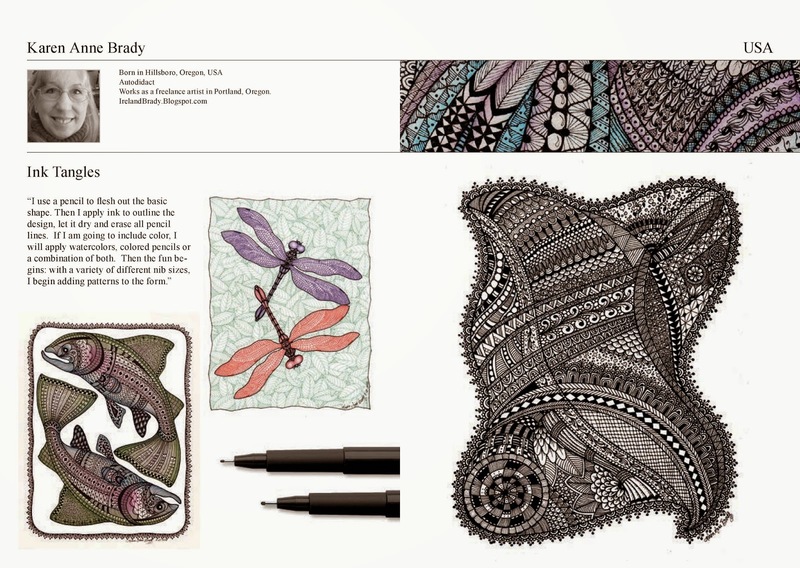 Earlier this year I was contacted by a representative of Faber- Castell with regards to having my artwork included in a 19 page brochure they were creating for 2014 featuring artists, who use their Pitt Artist Pens, from all over the world! I was extremely complimented and delighted that my work would be included in this project, along with so many other talented artists, to say the least. 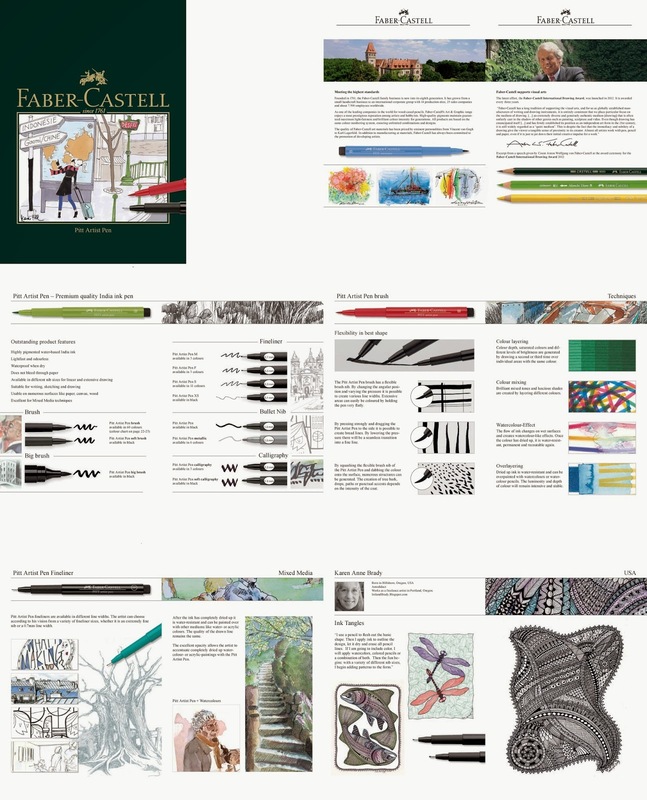 Faber-Castell emailed me a copy of the brochure a while back, but with all that was going on with Mom and Jim, I just kinda forgot about it. Yesterday, while cleaning up the mess of saved files on my desktop, I came across the PDF file I had received from them. Today I "Googled" how to change pdf format into jpeg format so that I could share a portion of the brochure with all of you. I have condensed the brochure to include the first 5 pages and page 11, the page on which my work is featured. If any of you would like to see the brochure in its entirety, let me know and I will be happy to email a pdf file to you. In addition to five loads of laundry and walking the doggie, I also managed to get the background watercolors painted. I can already see how the colors are going to dictate the ink work I add to the piece tomorrow ... hope it turns out as well as I am seeing it in my mind! 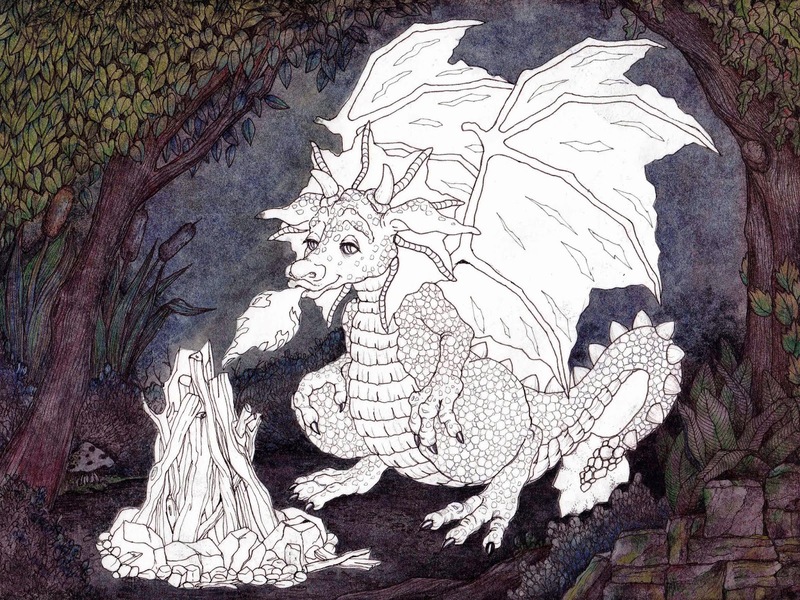 I have covered Lil' Dragon and the fire with frisket film to protect that portion of the drawing while I am working on the background. The hardest part with the frisket film is cutting around the protected area with an X-acto knife then removing the excess film, tedious and time consuming work. I have to tell you, working with watercolors on Stonehenge paper is terrific! I literally had this piece of paper sopping wet today, I had applied too much dark paint and I was dunking paper towels into water and sopping up excess paint; I am just amazed that there is only a slight curve to the dried paper. Amazing! Today I transferred the pencil sketch to Stonehenge Paper in ink. I am pleased with how it turned out and look forward to beginning the coloring process. I am also saving copies of the ink drawings for coloring pages, it is always fun to surprise neighborhood kids with a fun page to color! 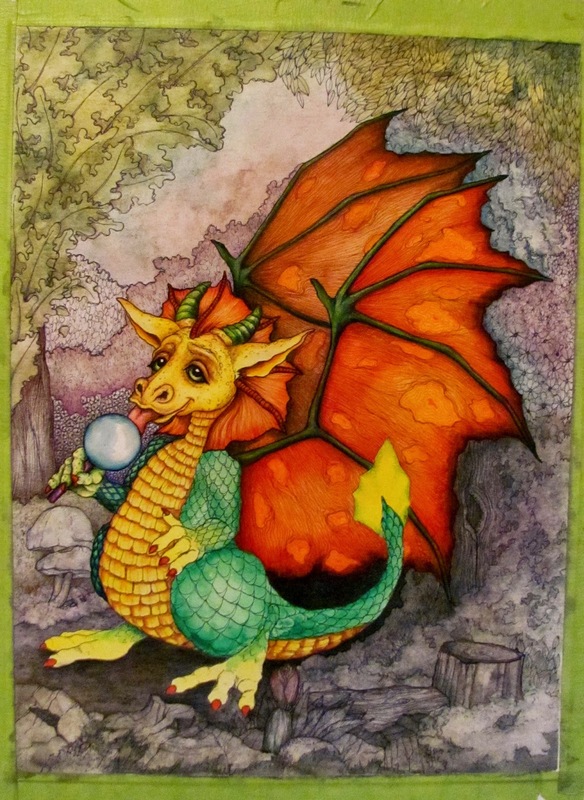 I'm going for a similar background as I did with the first Lil' Dragon but am inclined to doing him in blues, lavenders, reds and possibly green this time ..... we'll see! 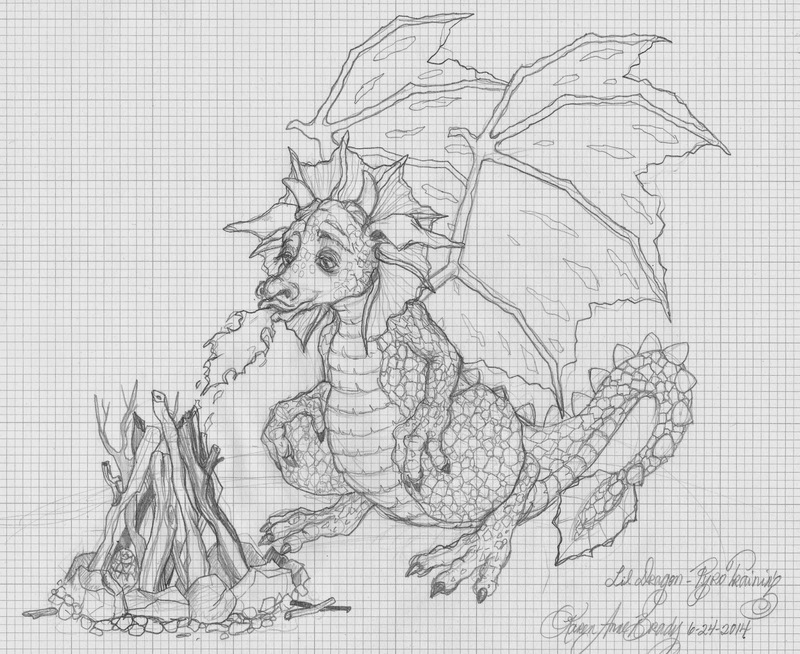 I definitely have dragons filling my head and have just finished a sketch for a new piece, this one will be of Lil' Dragon in "Pyro In Training". This is also a piece showing the evolution of this little character. I have changed things a bit in his physical appearance and have started calling him "Danny Boy, Lil' Dragon in Training"! In other words, Lil' Dragon is evolving! This particular illustration was prompted by my youngest grandson, Jake, who dubbed himself "Pyro in Training" these past few weeks when he was learning to start a fire with excess tree debris in our backyard fire pit. Now he (Jake) just has to work on how to burn a "clean" fire sans smoke! Thanks for the inspiration Jake, my boy! 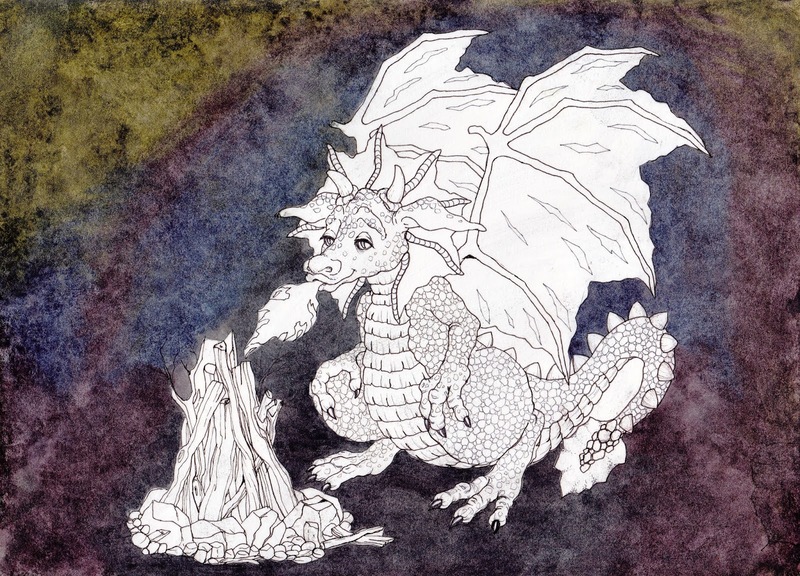 Happy to present my initial sketch of "Lil Dragon - Pyro In Training"! So, for the next several days we will be following the progress of a Lil' Dragon in Training! Hope you will enjoy his progress as much as I surely will! Lil' Dragon finished on 6/18/2014! I had a bit of time after all the other stuff that needed tending today so I was actually able to work a bit on the Lil' Dragon. Today his face and arm/hand holding the Dragon Pop have been completed and I started shadowing on the yellow part of his torso ... I think I may just complete this lil' guy tomorrow! PS Today I received two lovely comments from Oma Linda and Lise ... would you believe, I hit the "Delete" button instead of the "Publish" button! I just want you both to know I received you comments, and I loved them ... that Delete button is just too darn close to the Publish button! Sorry Oma Linda and Lise! Put on some nice classic Rock Radio today and began working on the Lil' Fella! 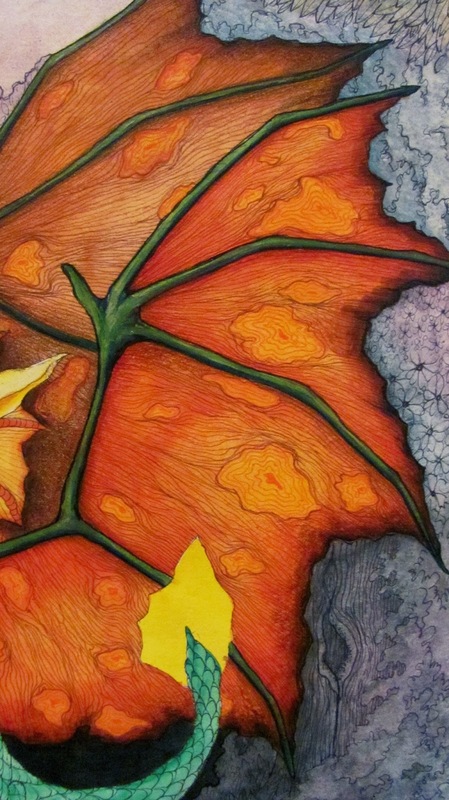 Using my Yarka Watercolor paints I applied a nice bright coat of color which I am following up with shadowing using my Prismacolor Verithin pencils and Tombow Irojiten pencils. The pens are Prismacolor Premier Fine Line Markers (.005) for the extra fine and color lines, with Faber Castell Pitt Pens for the stronger black ink lines. I managed to finish up his wings today and I am very happy with the results. I'll have to wait until Wednesday before I can work on the drawing again because I have too many scheduled things to take care of tomorrow. Really looking forward to Wednesday!